Home News Are those Cold Storage units or unauthorized abattoirs? Are those Cold Storage units or unauthorized abattoirs? A team of officials from the Department of Food Safety and Standard Authority of India, the Pollution Control Board and the Department of Animal Husbandry, along with the city police, closed down the cold storage’s and issued them notices to produce relevant documents. 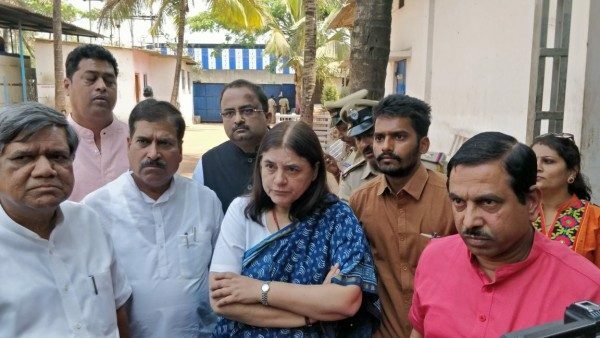 Today Smt.Maneka Gandhi, along with leader of opposition Jagadish Shettar and MP Suresh Angadi, Pralhad Joshi and others visited and inspected, allegedly unauthorized abattoirs in Autonagar industrial area, Belagavi. Srushti Agro Cold Storage, Neil Agro Cold Storage and Seven Star Cold Storage were closed down. They have been charged under various sections of the Food Security Act and other legal provisions. Animal Welfare Board of India’s Bengaluru office had filed a complaint with the Mal Maruti Police. Adv.Harshvardhan Pramod Patil had given a complaint to Honorable Central Minister Maneka Gandhi and Animal welfare board of India regarding illegal slaughter house in Belagavi in 2017. On 1/10/2017 first FIR was registered by Harshvardhan Patil regarding illegal slaughter house with the help of AWBI. 13 Bovines were rescued after which that slaughter house was shut down. After that another attempt was done against illegal cold storage house in Autonagar Belagavi, which was foiled due to the intervention of other political persons and highly influential Storage owners according to the BJP leaders. Recently Another complaint was given by Adv.Patil to AWBI and a raid was conducted and together in tons illegal Beef and other parts of meat worth approximately 20 to 30 crores was caught and seized, alleges Advocate Patil. The BJP leaders again said that the workers in those cold storage’s are mainly illegal Bangaladeshi immigrants but no police inquiry has been done. Is the police working under any political pressure ? Is what the BJP leaders asked. Smt Maneka Gandhi immediately called upon the DC, ZP CEO, Police commissioner and asked them to act as per law or they will have to face action. Lawyer Harshavardhan Patil said that Raju Sait, the MLA’s younger brother, had offered him a bribe of Rs. 75 lakh not to pursue his complaint. However, Raju Sait has denied the allegations. On Wednesday, MP and BJP leader Suresh Angadi said that Congress leaders were supporting such illegal units. Politics has become such a ruthless profession that only making money by hook or crook matters. Ethics be damned. This is true of all parties. We are left with choices between two evils.